Vinyl fencing is durable and long-lasting, making it an ideal choice for most exterior purposes. Vinyl fences are easy to clean and most stains can be removed successfully. 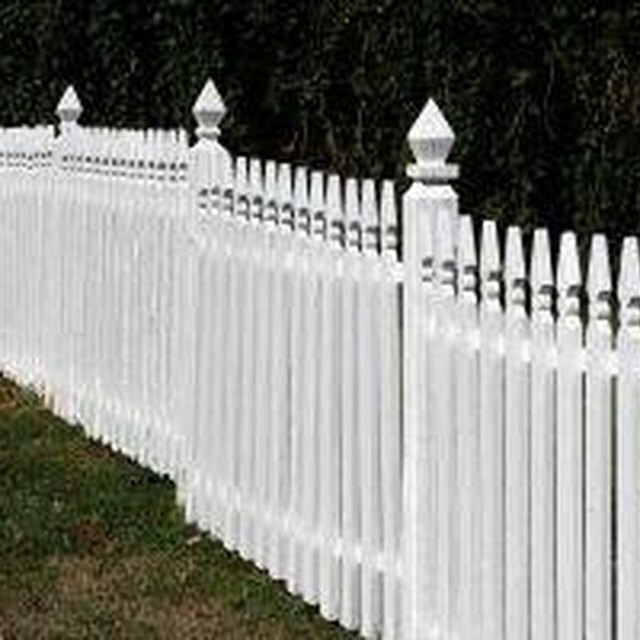 If your vinyl fence has been marked with graffiti, there are several products that can be used to remove it. Graffiti can be in the form of marker, chalk, paint or a variety of other sources. Cleaning graffiti from vinyl fencing is a process of trial and error; it may be necessary to try different products to find the right one to remove the specific type of graffiti. Graffiti ruins the appearance of the entire fence. Squirt liquid dish soap into a bucket. Fill the bucket with hot water. Wet down the fence with plain water from the garden hose. Wipe down the fence with the sponge and soapy water to remove the graffiti. Rinse the fence with plain water and allow it to air dry. This may be all that is required if the graffiti is marker, chalk, crayon or a similar substance. Use a stronger product if the graffiti is still present or if it is in the form of paint. Solvents such as turpentine, lacquer thinner, mineral spirits or acetone can all be used. Pour the solvent into a clean, empty spray bottle. Make sure that the bottle has not been used before with any other solvents or cleaning products. Even a small trace of certain chemicals can cause a negative reaction with some of the solvents. Spray a modest coating of the solvent onto the graffiti-stained area of the fence. Wipe the fence with a clean, dry rag. Wipe the rag over the graffiti in only one direction as opposed to scrubbing. Scrubbing will only smear the graffiti. Rinse the fence with plain water from the garden hose. Repeat the process of cleaning the fence with the solvent if the graffiti remains. If one solvent is ineffective, try a different one. Clean the fence thoroughly with soap and water and rinse when switching solvents. Do not allow solvents to remain on the fence for long, as they can mar the vinyl. Wipe them off as soon as you spray them on. Wear rubber gloves and clothing that covers your arms and legs when working with strong solvents. Avoid skin or eye contact with the solvents. Do not use these solvents around an open flame.